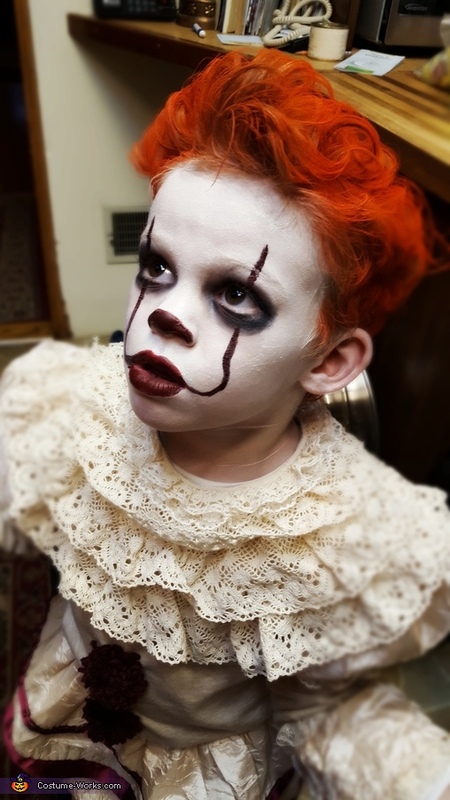 My son Hudson, who over the summer was petrified of a friendly party clown, told me he wanted to be the "scary clown" from the commercials for 'It'. It was the first Halloween he had shown an interest in choosing his costume. I took him to a Halloween store, thinking he'd see Paw Patrol and change his mind. He said all the costumes were great but he wanted to be the scary clown. Small set back: there is ZERO market for killer demon clown costumes for toddlers. So I started drawing sketches and materials in September to create Pennywise. It's not as intricate as it looks, just good foundations and lots of planning. I enjoy being creative and work in all kinds of mediums. It made me most proud when he put it all together, let me paint his face and looked into the mirror for the first time. He beamed and thanked me. He totally enjoyed playing the role all night; dancing down the sidewalks, adult men crossing the street so not to pass him and their children squealing with delight at their father's fear. I created the treat bag, because it wouldn't have the same effect with a pillowcase...my son tied a red balloon to its handles and the only thing I regret is not donning a yellow rain slicker to complete the package.